Pre-registration is closed. If you would still like to help additional volunteers are needed at Parkridge Park. Ypsilanti Proud, formerly Ypsilanti PRIDE Day, is a community-wide event intended to foster community pride and encourage local business growth by creating a clean and welcoming environment. 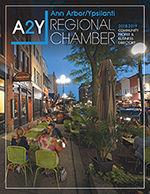 It began as a class project by the 1995 graduating class of Leadership Ypsilanti, an experiential learning program sponsored by the Ann Arbor / Ypsilanti Regional Chamber, and is now sponsored by the A2Y Chamber Foundation. 500-1200 volunteers spend the morning picking up litter, painting, planting flowers and otherwise beautifying the Ypsilanti community. After the clean-up, volunteers are treated to lunch and entertainment at the Post-Event Celebration. We need additional help this year funding a safety fence for baseball diamond at Parkridge Park. For the past few years, the Ypsilanti Proud committee has focused on a signature project for the event. Last year the signature project included substantial work at Parkridge Park centered around the baseball diamond, which had not been used in years, and after last year’s event was improved drastically. This year we will be continuing our work at Parkridge Park to improve the baseball diamond to make it safe and playable for all children and provide the opportunity to hold organized league games. To host those games, we need to install a safety fence down the first base and third base lines. We are currently working to finalize this fence project, for installation on May 20 for Ypsilanti Proud Day. We currently have many community organizations helping to fund the project but need a few more. Please consider making a difference to this important community project. Please contact Barbara Davenport to make your contribution at 734.214.0104 or Barbara@a2ychamber.org. The Chamber Foundation is a 501 (c) 3 Corporation.